Virtual pet simulator Little Friends: Dogs & Cats will be coming to the west courtesy of videogame publisher Sold Out. 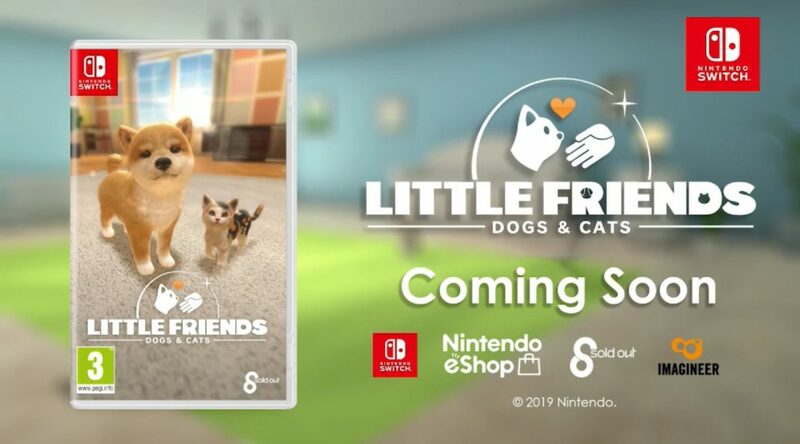 Little Friends: Dog & Cats released on Nintendo Switch at the end of 2018 in Japan. Sold Out has announced today that they have partnered up the game’s developer Imagineer to bring Little Friends: Dog & Cats both physically and digitally to Europe and North America. Choose from a variety of puppies and kittens to play with, feed, pet and dress up in an adorable simulation that’s fun for all ages. Get to know their personalities and feed them their favourite food! Play with them using their favourite new toy, or take your puppy out for walks and compete in the flying disc tournament. Dress them up in over 600 stylish accessories to make them look their best. Care for your new furry friend to develop a long-lasting friendship. ● Meet your new best friend! Choose from 6 breeds of puppy and 3 cute kittens, including Labrador Retriever, German Shepherd and French Bulldog. Give your new friend a name, care for them and develop a bond with them. Lifelike animations help bring your little friends to life. ● Play with them! Use the Nintendo Switch touch screen to pet your new friend, or take your puppy pal out on walks to keep them as happy as you can. Play ball, practice for the flying disc tournament, and unlock new toys as you play. Play with up to 3 pets at the same time, or use the hotel to keep up to 12 furry friends. ● Get to know them! Learn what your pet prefers to play and feed them their favourite food. With hundreds of lifelike personality traits, getting to know what each pet prefers is important for bonding with your little friend. ● Dress up! Choose from over 600 stylish accessories to dress up your new companion. Once they’re ready, take screenshots to remember their amazing outfits. ● Look after them anytime, anywhere! Take care of your cats and dogs on the go, or put the console in the dock to continue playing on the TV.